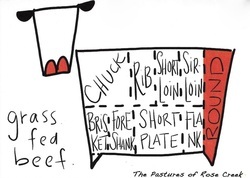 Our grass-fed, grass-finished Lim-Angus beef is available in 1/4, 1/2, and Whole orders on a seasonal basis. It takes two full years to grow a cow or heifer on a grass diet to harvest weight. In order to give you the most up front and timely information on costs, we charge based on the animal's live-weight. * You are responsible for paying us the remaining portion prior to pickup of your meat. The abattoir charges a harvest fee of a $100 per animal and a cut and wrap fee of .65/lb based on hanging weight**. We will pay these fees on your behalf to the abattoir. *Live weight is what the animal weighs the day of harvest. The typical weight is around 1,000 lbs. **Hanging weight is what the animal weighs after harvest and all non-usable parts are removed. Approximately 60% of live weight. So, a 1,000 lbs live animal will have a hanging weight around 600 lbs. ***Boxed weight is the actual cuts that you get packaged at back. Our cows have been averaging a 75-79% return on hanging weight. So, a cow with a hanging weight around 600 lbs, will yield around 450 lbs of meat. Here's an example based on a 1000 lb cow. Send us an email. We can let you know when our next cow is available for harvest. The Pastures of Rose Creek. We will let you know when your beef is ready for pick up from the abattoir. Your portion of beef will be boxed, frozen, and ready for your freezer. We will meet you at the abattoir to ensure everything is correct and to your liking.